"Wood's Farm" - Evinston , Fl 10"x 10"
October is almost over and Halloween is already here. This months painting auction ends Sunday, Oct. 31. There is still time to bid and add this original oil painting to your collection or give it as a gift during the holidays. The current high bid is $80.00. Bids may be offered until 5 pm EST, Sunday October 31. Painting on location is a challenge. The wind, bugs, creepy crawleys, rain, dust, and changing light are just a few of the obstacles to overcome. But it is well worth the effort. The point of plein air painting for me is to absorb as much of the atmosphere as possible and translate that into my painting. 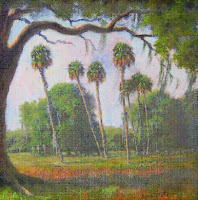 I rarely try to create a finished painting on location unless I am in a Plein air Event. Instead I use these studies for future studio paintings. I don't want a finished painting I want the essence of the moment. Join me for a plein air workshop October 28-29, 10 am - 3 pm. We will be painting in Silver Springs Attraction with a variety of subjects to paint that is comfortable and safe. Contact Korene Wilbanks at the Appleton Museum: wilbankk@cf.edu or call 352-291-4455, ext. 1613.
you never know what you are going to get." The art business and shows are the same way. I had a very nice show at Thornebrook as I told you yesterday. I came home happy with sales and the weekend as a whole. 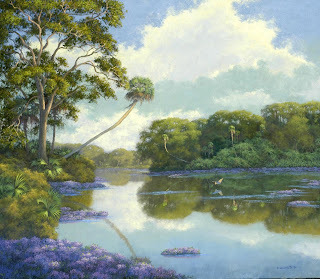 Then I got a call yesterday afternoon with an inquiry "do you still have the LARGE painting of the river with hyacinths?" Yes, I do. "Something Timeless" (30"x36") was scheduled to go to Thornebrook Gallery in Thornebrook Village. Instead it is going home with Brian and Vivian who have several of my paintings in their extensive art collection. Viv came to the show looking for a painting with "just one bird in it, not a whole flock". She picked out and bought a small painting but also fell in love with this bigger one and knew right where she wanted to hang it. Remember..."the show is not over until the fat lady sings". This past weekend was a beautiful weekend for an art festival and lots of other things here in north Florida. As a result, not as many people as usual attended the festival. But, the ones that did come out were ready to buy. I sent Geclee Reproductions as well as original oil paintings home with collectors. Lyn White and her committee did a great job once again. This is a comfortable show that is very family friendly. Not too big with too many artists - if there are too many artists to chose from collectors get overwhelmed and do not buy anything. Lynn had a good mixture of every medium, not heavy in any category. Saw long time artist friends and collectors and made new friends. It was a good way to start my show season. "Wood"s Farm-Evinston, Fl." Oil on board 10"x10"
I had a great time at Freddie Woods farm in Evinston, Florida creating this painting. I set up to paint under a canopy of giant old oak trees. A breeze blew across the field from Orange Lake and all was right with the world. Half way through this painting I moved a bit and brushed my ankle against a stinging nettle causing much pain. If you have been in Florida long I know you have met "The Nettle". 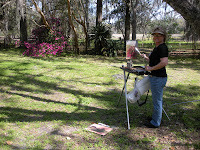 Ok, that is part of the joy of painting en plein air (on location). So, back to work. Ants and mosquitos came next...out came the Skin So Soft. The sun had moved by then and I was in direct illumination....yep, sun screen to the rescue. But, one has to keep working. The last straw was the herd of cows ambling my way. It seems I had set up right in their well worn path to the next field. Cows are not the most intelligent animals ... one almost walked over my easel before she discovered a barrier in her way. Thank goodness she veered off at the last minute. For a city gal, being surrounded by a herd of huge bovine is a little uncomfortable...I sat in my car until they passed. I experienced some of life's unexpected pleasures and came home relatively unhurt and with a painting I was happy with. All in all it was a good day!